Learning new skills can be enjoyable and fun, but it can also offer you a head start in life to have a good knowledge base. Find out the benefits of teaching your teenager essential skills. Teenagers aren’t always the most cooperative of people, liking to do their own thing or hang out with friends. But if you can manage to coax your teen away from their habitual haunts once in a while, teaching them some essential skills could prove very handy for them in the future. One of the keys to teaching such skills is to package them up well for your teen so they don’t think they’re being taught things. It’s also beneficial if they’re able to see them as fun, learning a secret, doing something different or outrageous. Of course, if your teen is happy to be taught new skills at the weekends without much persuasion, then leap at the chance to do so! Older teens are likely to be looking towards having driving lessons and maybe even getting their own car. 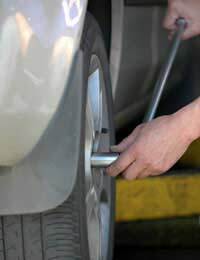 Helping them gain various aspects of vehicle knowledge could be useful and one particularly handy skill to have – especially with students who may have old bangers – is how to change a tyre. It’s not just something for boys to learn either, as it’s equally useful for girls to have this knowledge too. If your teens will be heading off to university, then the chances are they will need to know how to cook. Teaching them basic cooking skills, such as how to boil an egg, how to make quick and easy meals and how long to cook things for, will prove really useful to them in the long run. Getting actively involved in the cooking process is a positive move – and they’ll be more likely to be agreeable to the idea when they get to eat the end results! It sounds obvious, but far too many teens are used to having their washing done for them. However, once they’re living away from home, at university or elsewhere, they’ll need to take care of their own clothing and that means washing it. So try and help your teen learn the ropes with using a washing machine (and tumble dryer, if you have one), so that they feel at home using one before they’re on their own. Being able to get on with other people, socialise and make friends is one of the most important life skills we can learn. Teens are likely to have been used to having potential friends ‘on tap’, through being at school with lots of peers, but once they’re out in the big wide world, it’s often harder to find good friends. As a parent, you can be a good role model and help your teen pick up key socialisation skills by your own example. If they’re used to seeing their parents socialising with their friends, or being involved in regular gatherings with friends and families, then the chances are they may subsequently pick up the necessary skills too.